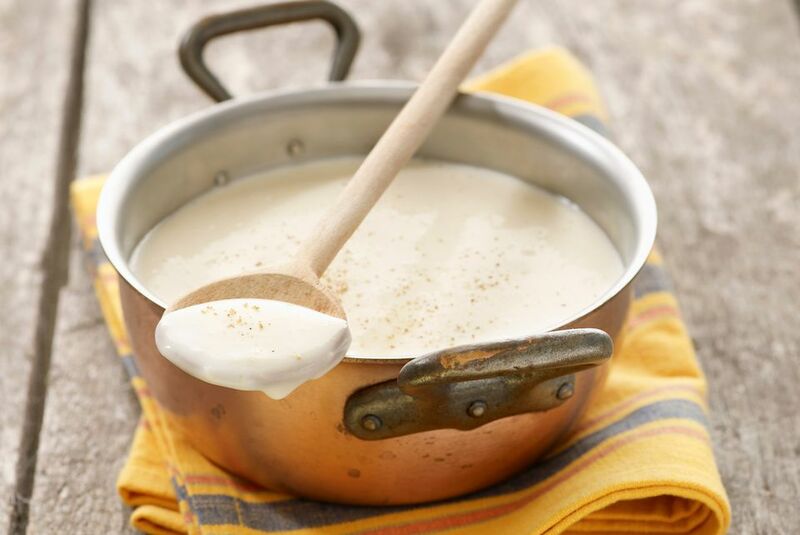 Béchamel is a standard white sauce and one of the five mother sauces of classical cuisine. That means it's the starting point for making other sauces, which are called "small sauces." And what a sauce it is! Béchamel is by far the easiest of the mother sauces to make. It is milk-based and the procedure for making it is wonderfully idiosyncratic. Until you've used whole cloves to pin a bay leaf to an onion, you haven't fully lived in the kitchen! Béchamel is also among the most versatile. While hollandaise is hollandaise, and there aren't too many classical variations on it, béchamel is the source of any number of creamy, cheesy, and velvety sauces. It's so versatile that you'll always have a sauce to serve with fish, seafood, vegetables, and poultry. A traditional béchamel sauce is made by whisking hot milk into a simple flour-butter roux. The sauce is then simmered with onion, cloves, bay leaf, and nutmeg until it is creamy and velvety smooth. The trick is to tack the bay leaf to the ​onion using cloves. This makes everything easy to remove so you don't have to fish around for bits left in your sauce after straining. Sauce crème is an original classic cream sauce. It is also one of the simplest variations on béchamel sauce. This one is made by whisking heavy cream into the finished béchamel and adding a little salt and pepper to taste. You can make this sauce a little more interesting by adding chopped chives or parsley. Not only will it create a nice flavor, but it also adds to the visual appeal of this all-white sauce. The mornay sauce is made by enriching a standard béchamel sauce with gruyère and parmesan cheeses. It's surprisingly similar to making macaroni and cheese from scratch! This béchamel variation is an ideal accompaniment for vegetables or pasta. It's an excellent choice for chicken or fish as well and you can play either up with a little stock to create a velouté sauce variation. For the soubise sauce, you'll sauté onions, then purée them. This is added to the béchamel. It's a classic cream sauce that you'll want to make for any vegetable dish, though it works just as well with chicken or eggs. You can even use this onion-y sauce for a casserole base, so it's quite handy to know. For a simple variation, add some tomato purée to the finished sauce just before serving. Nantua sauce is a classic seafood sauce. This version is made by incorporating shrimp butter and cream into a basic béchamel sauce. Traditionally, however, it is made with crayfish. The sauce is delicious with fish and seafood, especially shellfish. Just be sure to get your timing right because it should be served immediately. Since seafood cooks fast, you'll likely want to have your béchamel ready to be reheated at the last minute. There are many ways to make a cheddar cheese sauce, but one of the best is with a béchamel base. All you need to do is add cheddar cheese, mustard, and Worcestershire sauce. Like the mornay sauce, this cheddar cheese sauce is great with vegetables, pasta, and fish. Yet, it doesn't have to be anything fancy! It works just as well on macaroni and chili dogs as it does on a five-star dish. Béchamel uses milk and butter, so it doesn't fit specialty diets like those for vegans and people who can't consume dairy products. This dairy-free béchamel sauce takes care of that issue! You can still enjoy the creamy taste of a béchamel with soymilk, olive oil, and flour. It's a very simple recipe and a useful white sauce that can be dressed up in many different ways.